and 36142, the 4th Battalion (Reserve) Manchester Regiment. William's parents were Robert and Mary Ann (nee Hewitt) who had married in 1887. He was born in Oldham, in the first quarter of 1892. On the 1901 census 9 year old William ('Billy') is living with his parents, two older sisters (Sarah and Lily) and two younger sisters (Alice May and Jane) on Stirling Street in Chadderton. Robert (age 34) was an iron moulder and Mary Ann was a 'grocer'. 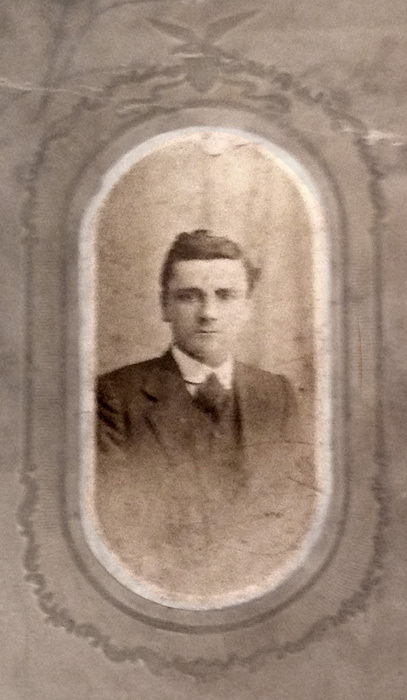 On the 1911 census, 19 year old William is living with his mother and three of his sisters ( Lily, Alice May and Jane), on Flora Street in Oldham. William was employed as a spindle setter in an ironworks. In 1914 William married Helen Leach in the Primitive Methodist Chapel on Henshaw Street, Oldham. They lived at 39 Franklin Street and would have two children, May born in later 1914 and William born in December 1915. William's army service record (part of the burnt records, WO 363, at the National Archives) can be viewed on 'Find My Past', etc. From these, although in poor condition, badly damaged and incomplete, we can learn that William attested to his willingness to serve in the army in the event of need, under the Derby Scheme, on the 9th of December 1915. At the time he was living at 39, Franklin Street; was a mule spindle setter; and just 2 weeks from his 24th birthday. Despite being a married man with two infant children, William was mobilised on the 15th of May 1916 as a private, number 36142, to serve in the 4th Battalion (Reserve) Manchester Regiment. We don't learn where he spent the next few months (presumably in training) but on the 29th August, 1916, he embarked at Folkestone for France and disembarked in Boulogne later that same day. On the 30th August, at Etaples, he was posted temporarily to the 16th Battalion, the Manchesters. Ten Days later, on the 9th of September he was transferred to the 8th Battalion, the Loyal North Lancashire Regt. and joined them in the field on the 11th. On the 14th of October 1916 he was recorded as 'wounded in action' and admitted to the 26th General Hospital at Etaples, with contusions to back and foot. On the 18th of October he embarked on the SS 'Dieppe', returning to England, and was admitted to Horton War Hospital, Epsom, the following day. He remained there until early December, when he was granted 10 days leave before returning to "light duty and the likely return to active service within 3 months". His address whilst on leave would be 137 Ward Street, [Featherstall Road] Oldham. His next record shows that on the 9th March 1917 he embarked at Folkestone, disembarked at Boulogne, and the following day "Joined 25th Infantry Base Depot and was posted to Loyal North Lancs. for record purposes." On the 27th March he was posted to the 4/5 Battalion of the Loyal Nth. Lancs. and joined them in the field on the 29th March. On the 4th August 1917 his record shows him as 'sick' and admitted to hospital ... rejoining his unit on the 22nd August. On the 26th of October 1917 he was wounded in action with a gunshot wound to his hand and again returned to hospital in England, this time to the Scottish General Hospital in Edinburgh. He was hospitalised until the 4th December, when his report stated that he had "Contusions to his back [but] no wound; [injuries] susustained in proximity to shell explosion. Hand slight wound on fingers now healed." On the 15th December 1917 he was posted to the Depot, Loyal Nth. Lancs., Felixstowe. 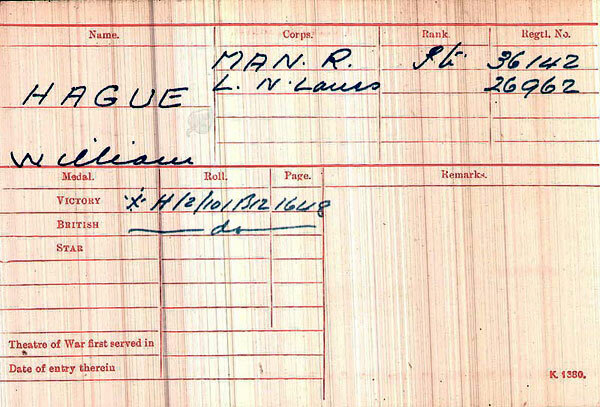 The next dated entry is the 1st April 1918 which records him as posted to the 9th Battalion the Loyal Nth. Lancs., at Etaples, via Folkestone and Boulogne. 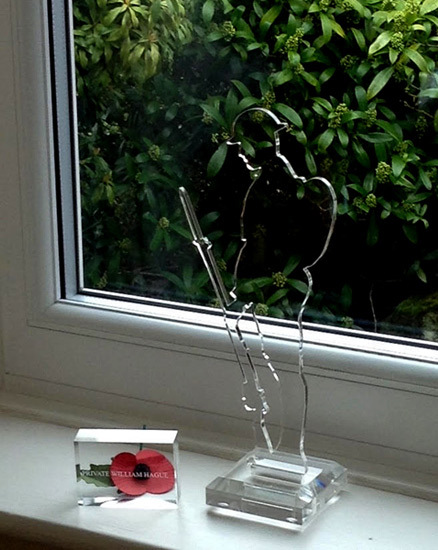 On the 8th April he joined his Battalion in the field. On the 10th April he was reported 'missing' and subsequently 'presumed dead'. His body was never recovered and he is remembered on the Ploegsteert Memorial, near Hainaut in Belgium. The 'Spring Offensive' by the Germans along the Western Front, began on the 21st March 1918 and, over the next couple of months, the allied front line was swept back for many miles towards Paris, by the numerically superior German troops. There were terrible losses, on both sides, all along this front. It appears, from the dates and location of his memorial, that William's Battalion was probably fighting in the Lys Offensive, between 9th and 29th April. (See map HERE in the page about the Manchester Hill Battle in the Spring Offensive).